Travel Photo: A Torajan Coffee Seller - Be On The Road | Live your Travel Dream! The Indonesia Kopi packs quite a unique flavor and is quite an important part of Indonesia’s ‘Nongkrong’ culture. Hence, I was all pepped up when I saw the coffee estates in the Sulawesi island of Indonesia. They are quite strong and come with their own special aroma. 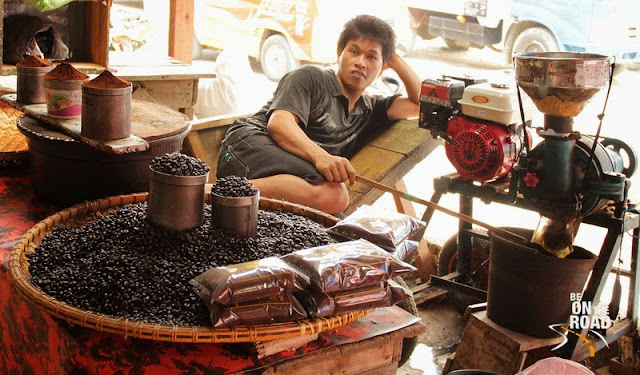 While the coffee estates are beautiful, the subject here is the roasted coffee beans and the local Torajan seller who either sells the coffee beans or grinds them and then sells the coffee powder. What I really loved is his relaxed attitude towards his work. He simply put his feet up and once a while used his stick and cloth to shoo away the flies. And when someone looked at him, he simply smiled. And that is precisely what happened with me. And he was kind enough to let me take his photograph. This in essence captures the mood of Tana Toraja, which is very relaxed and blessed with natural beauty. The people of Toraja are easy going and love their relaxed life. They are very proud of their traditions and love their coffee fiercely. If you ever get a chance to visit Tana Toraja, do check out this relaxed culture, their traditions and their coffee. Welcome to BE ON THE ROAD Travel Blog! I am Sankara, its founder, a 30 something male from Bangalore who is living his dream of exploring the world and simultaneously trying to inspire others to live their dream. Wanna live your dream? Find Some inspiration here! Wanna know more about me? Track blog updates from facebook and/or twitter! Borneo’s Kinabatangan Wildlife Sanctuary: A Gem for Wildlife Lovers! How to improve performance and looks of your Royal Enfield Motorcycle? How to plan a long motorcycle trip across India? Singapore and Food: Made for each other!! Join the Travel Club for FREE!! and every fortnight get in your inbox...interesting experiential and off-beat travel stories , destination guides, handy tips (travel, photography and visa) based on personal experience, global vegetarian delights with helpful survival guides and gorgeous world travel images and videos as I (the Indian traveler) trot the globe! And a lot of other travel invites and soon to be launched goodies !